Luigi and Yoshi in the SNES version of Mario is Missing! Luigi in the DOS version of Mario is Missing! Rome (Italian: Roma) is the capital city of Italy. Alongside Beijing, Nairobi, Moscow and San Francisco, it is one of the five cities Luigi must visit in Mario is Missing! in order to defeat Ludwig von Koopa in the SNES version and Larry Koopa in the PC version. Several items were stolen from famous landmarks by Bowser's Koopalings: in the NES and SNES versions, these include a Gladiator's Spear from the Colosseum, some Coins from the Trevi Fountain, and the Sistine Chapel ceiling from the Sistine Chapel. In the PC version, alongside the spear and coins, Michelangelo's Paintbrush is stolen instead of the Chapel's ceiling, a Column is stolen from the Pantheon, and a Bannister is stolen from the Spanish Steps. 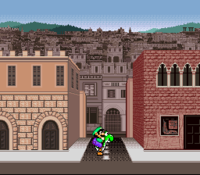 When in Rome, Luigi must ask the locals questions about the area and answer geographical and historical questions to return the items to their rightful place. Rome is also referenced by Donkey Kong in the Hard Work song from The Big Chill Out in the Donkey Kong Country television series. "Maybe I should wear a suit, because this country is shaped like a boot." "You could try 'Rome-ing' around to figure it out." "Changed my money to lira at the border. 'To the Tiber' was my order." "You're on a boot-shaped peninsula in southern Europe, somewhere in the Mediterranean." "If you brought Italian shoes from home, we could climb the Alps for a peek of Rome." "This city was built on 7 hills in 753 B.C. It was home to Caesar, the original Italian Stallion." "This is sort of a riddle, remember Nero and his fiddle?" "Your capital is now lira in this capital city. Just do as the Romans do." This page was last edited on January 13, 2018, at 12:48.